Westend Backpackers i Sydney, Australien: Reservér nu! Full Payment of the group booking must be received two weeks prior to group's arrival date. If there are any alterations after this time, Westend will charge for additional guests at full rate and in the instance of a reduction in numbers Westend will refund the reduction (with more than 2 weeks notice). If the group cancels with less than two weeks notice yet more than 48 hours notice the first night of the total group booking will be charged to the group credit card. If the group cancels less than 48 hours notice or does not cancel, Westend will charge the full amount due for the group to the groups credit card details provided by Hostelworld. Please contact Lachy from Westend for more information. Westend Backpackers offers groups additional services such as meal planning and tour/activity co-ordination. Please ask Lachy from Westend for more information. Located in downtown Sydney, Westend Backpackers is only a short walk away from major tourist attractions such as The Opera House and Harbour Bridge, Darling Harbour entertainment precinct and Chinatown as well as bars, restaurants, nightclubs and transport links. 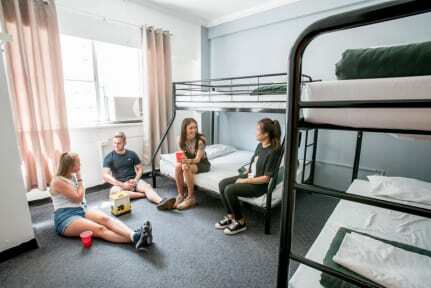 Westend Backpackers has dormitory accommodation ranging from 4 & 6 bed mixed and female dorms right up to Australia’s largest dorm; the infamous 32 bed “Church”. If looking for a space to yourself we also offer Double, Triple and Family private rooms to suit all your needs. At Westend Backpackers we aim to provide an experience and not just a bed. With both daily and nightly events visiting Sydney’s best tourist attractions, bars and nightclubs you will always have something to do during your stay! Featuring a 24 hour manned reception as well as 24 hour kitchen and communal facilities with TV, Xbox and lounges Westend Backpackers will become your home away from home. So what are you waiting for? Book today! Please note all guests international and Australian, need to present a valid passport upon check in. For further information please contact the property in advance, using the contact details found on the booking confirmation. Also note that all Special Requests are subject to availability and additional charges may apply. Late cancellations and no-shows shall be charged the equivalent of the first nights accommodation. If you arrive after midnight on the specified day of arrival your reservation will be cancelled with the cancellation fee of the first nights accommodation. Groups of 10 or more are not entitled to a free airport pick up. Credit cards have a surcharge of 1.5%. Individuals under the age of 18 must be accompanied by a parent. Children cannot be accommodated in dormitory accommodation unless prior approval has been given by the property. please note that we require the balance of your booking to be paid on December 1st. * Credit Cards which decline will have their reservations cancelled. cancellation of the said reservation. ***This property will be undergoing renovations from early February 2017 until further notice. During this period, guests may experience some noise or light disturbances, and some hotel facilities and services may not be available. The elevator will not be accessible from the Ground Floor from 23 February, 2017 until further notice. It will still be accessible from Levels 1-13. This unfortunately means that we are no longer wheelchair accessible.